My son Joshua has always had a fascination with natural and fictitious creatures like Dinosaurs and Dragons. His love of scary monsters evolved to the creepiest monster ever featured in movies: The Alien Xenomorph in the Alien films. He has had an intense fascination with the Aliens movie creatures for a several years now and even had an Alien themed birthday party this past summer. He will talk for hours about the different types of Aliens such as Xenomorphs, Dog Alien, Queen Alien, & Warrior Alien to name a few. For his birthday, he got an Alien mask that he loved, but didn’t like that it wasn’t realistic enough with the long head. 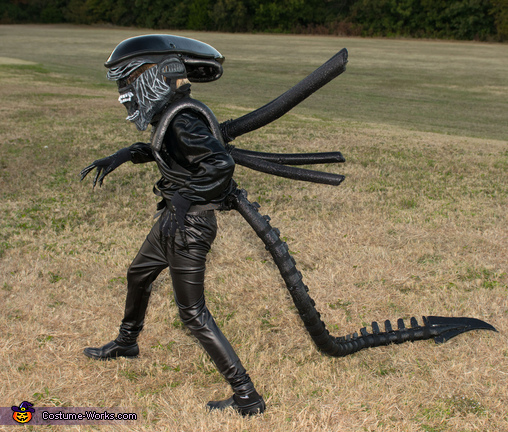 He wanted to be a realistic looking Xenomorph for Halloween, so I told him that I would have to custom make the costume as there are no commercial costumes for this creature. I started making his costume in July 2017 just after his 8th birthday. I knew a few months may seem like a lot of time, but it is most definitely not. I'm a full time surgical nurse and my time is extremely limited. I started his costume by first creating the tail. I used a piece of pipe insulation from a home improvement store as the base form. I had to use wire wrapped in tubing on the inside to make it stand up and give it shape. The wire had to be slid inside tubing to keep it from poking out of the foam tail. I used the edge of interlocking foam mats from a home improvement store to create the vertebrate in the tail and to create the helmet. I cut a pattern for the long head, then cut the foam to be formed into the shape I needed. With a heat gun and some contact cement I created the shape of the head. After the head was formed, sanded & primed, I poured black resin to give it the black shiny finish. I used some corrugated tubing along the edges for the trim of the head piece. I attached parts of a silicone mask with black fabric to give the look of the Xenomorph face, yet allowing my son to have plenty of room to breathe and see. I attached a soft Velcro strap that would snuggly and comfortably secure the head. The tail and other projecting spikes on the back were mounted onto a wood plank which was wrapped in foam and fabric to keep it comfortable. The projectiles in the back were also created with foam insulation tubing cut to size. I used adjustable straps, so I could ensure the tail and back piece would stay snug, but not too tight. My son is very sensitive to anything that is not perfectly comfortable to him, which makes my job very difficult creating a costume that he can tolerate wearing. The shoulder piece was made from a yoga mat, molded with a heat gun. I added some trim pieces and painted black for the illusion of ribs. I used a basic slick black shirt and pants for the base of this alien costume. The gloves were made from inexpensive black gloves that had a slick skeleton print. I used hot glue to attach dollar store type witch's fingers to each of the fingers of the gloves. I then used black nail polish to paint the slick white skeleton print and the entire witch's fingers to create very cool and menacing looking gloves. Oddly enough, these were my son's favorite thing to wear. I liked wearing the gloves too! Having those finger extensions on the gloves added a nice element to costume. t’s quite funny than only a couple of years ago, Joshua would run screaming and crying after entering a local Halloween shop with all the creepy décor. Now, he loves many creepy creatures like Alien Xenomorph. Creating this costume took several months and a lot of figuring it out as I go. Having a son that is very sensory, it is hard to create his vision of what he wanted and what he could tolerate wearing. Many adjustments along the way were made to make it happen. I’m very pleased with how this creation turned out and the overall effect is great. Everyone who has seen the costume loves it. Joshua got many compliments for Halloween in his costume. There were more things I wanted to add to the costume, but needed more time. My son has the Alien sounds down perfect and I think it turned out fantastic.